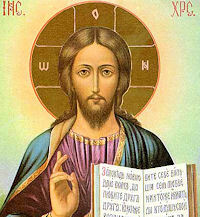 Today is the second of the O Antiphons, O Adonai (O Almighty God). As Moses approached the burning bush, so we approach the divine Savior in the form of a child in the crib, or in the form of the consecrated host, and falling down we adore Him. "Put off the shoes from thy feet, for the place whereon thou standest is holy ground . . . I am who am." "Come with an outstretched arm to redeem us." This is the cry of the Church for the second coming of Christ on the last day. The return of the Savior brings us plentiful redemption. Thou art He "who didst appear to Moses in the burning bush." "I have seen the affliction of My people in Egypt, and I have heard their cry because of the rigor of them that are over the works. And knowing their sorrow, I am come down to deliver them out of the hands of the Egyptians and to bring them out of that land into a good and spacious land, into a land that floweth with milk and honey" (Exod. 3:7 f.). Thus spoke the Lord to Moses from the bush which burned but was not consumed, which is a figure of God's condescension to assume the weakness of human nature. The human nature of Christ is united to the burning divine nature, and yet it is not consumed. As Moses approached the burning bush, so we approach the divine Savior in the form of a child in the crib, or in the form of the consecrated host, and falling down we adore Him. "Put off the shoes from thy feet, for the place whereon thou standest is holy ground. . . . I am who am" (Exod. 3:5, 14). O Adonai, almighty God! Mighty in the weakness of a child, and in the helplessness of the Crucified! Thou, almighty God, mighty in the wonders that Thou hast worked! Mighty in guiding, sustaining, and developing Thy Church! "The gates of hell shall not prevail against it" (Matt. 16:18). "Come with an outstretched arm to redeem us." This is the cry of the Church for the second coming of Christ on the last day. The return of the Savior brings us plentiful redemption. "Come, ye blessed of My Father, possess you the kingdom prepared for you" (Matt. 25-34). Excerpted from The Light of the World by Benedict Baur, O.S.B. To redeem us with outstretched arm. Today is Day Three of the Christmas Novena.